Oakland-based graphic designer Kenji Liu has recently embarked on a project that puts him in a long line of artists and polititians who have changed place names in San Francisco. His Decolonized Area Rapid Transit (DART) map is based on the official San Francisco Bay Area Rapid Transit (BART) station map. Liu has substituted the names of counties, bridges, transit stations and natural features that appear on the BART map with the names of local Native people and progressive political activists. In doing so, Liu has provided a vivid demonstration of the potential for using place names to invoke or erase local history. That same potential has also been revealed in battles over re-naming that have occurred repeatedly in San Francisco. In the Great Earthquake and Fire of 1906, thousands of San Franciscans lost their homes and began a process of re-settling the city in new patterns of density and demographics. Three years after the disaster, a commission of the Board of Supervisors convened to address those population shifts by updating the names of the city’s streets and reducing the confusion of new place names. Many of the changes – such as eliminating the multiple use of the same name for different streets – provoked little or no controversy. 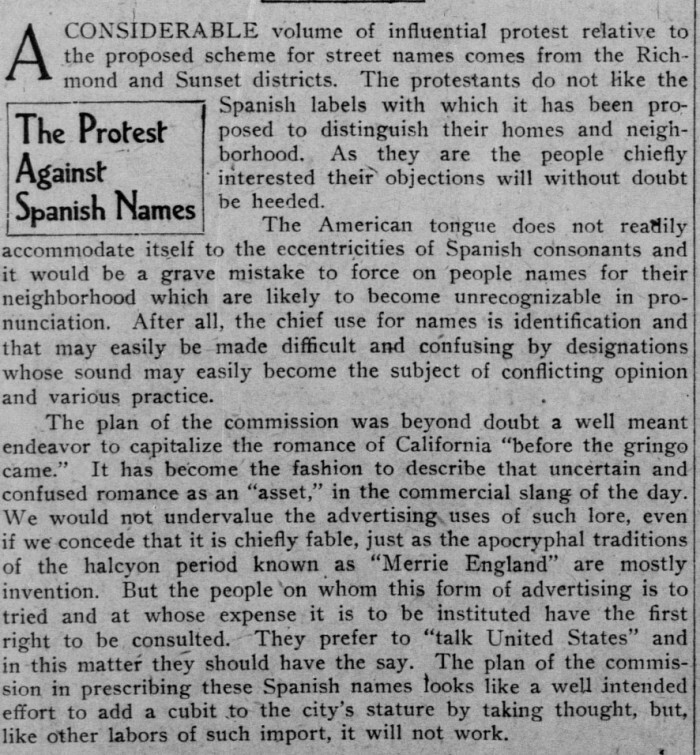 However, upon proposing renaming streets of the Richmond and Sunset districts with names drawn from California’s Spanish past, some residents of those neighborhoods protested vociferiously. They denounced the prospect of becoming San Francisco’s “Spanish Town” so soon after the U.S. victory in the Spanish-American war. While some concessions to residents were made by the Board of Supervisors, the use of Spanish names (such as Anza, Balboa, Cabrillo, Arguello, and Ortega) was nevertheless implemented for many of the streets. Editorial, San Francisco Call, November 24, 1909, page 6. Other street name changes have been less ambitious than those carried out by the 1909 commission. In 1988, Beat poet Lawrence Ferlinghetti successfully petitioned the San Francisco Board of Supervisors to change the names of twelve streets to commemorate local writers and artists. The new names included Jack Kerouac Alley, Isadora Duncan Alley, Dashiell Hammett Street, and Via Bufano. 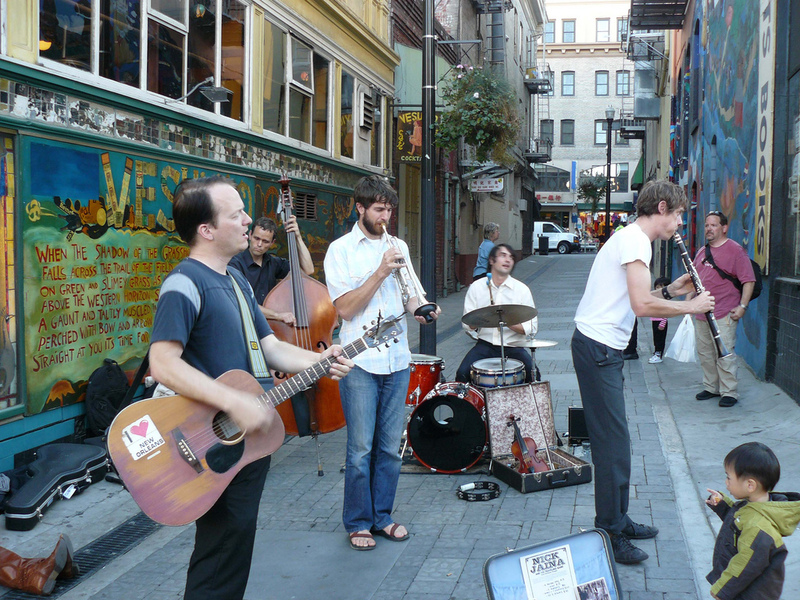 Nick Jaina band performing in Jack Kerouac Alley. 2008 photo by Chantel Williams. While Ferlinghetti’s changes highlighted the city’s artistic past, other San Francisco streets have been re-named to highlight the city’s political past. 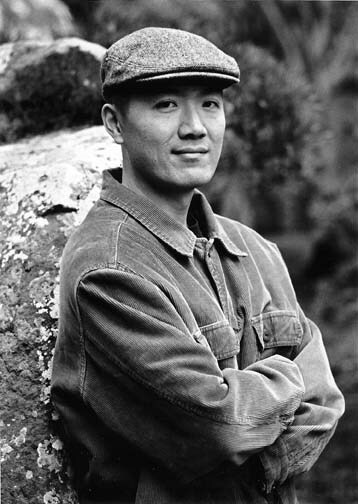 The Board of Supervisors voted in 1985 to change the name of Brenham Place, on the west side of Portsmouth Square in San Francisco Chinatown, to Walter U. Lum Place, in recognition of the Chinese American journalist, educator and civil rights activist. Another civil rights activist was acknowledged when the block of Polk Street in front of City Hall was renamed Dr. Carlton B. Goodlett Place in 1999 in honor the local African American publisher and physician. Similar changes have met with resistance, however. 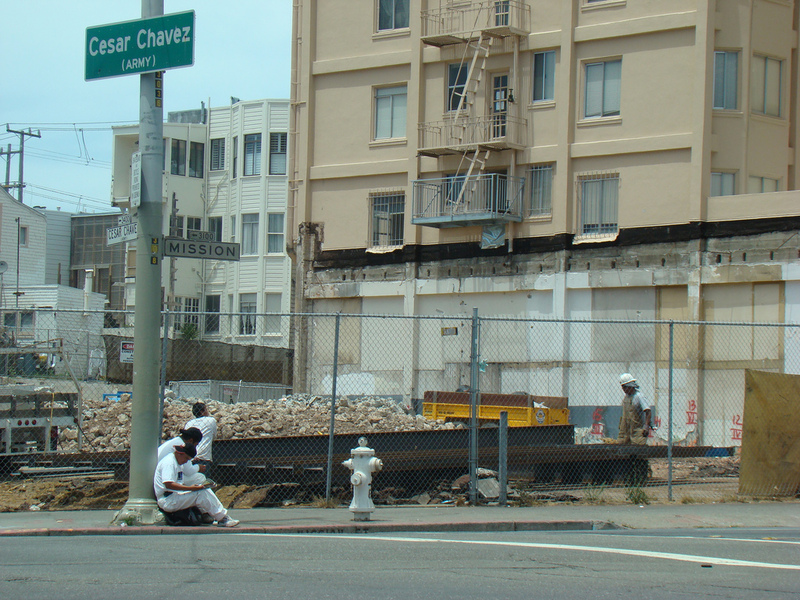 When the Board of Supervisors changed the name of Army Street to César Chávez Street in 1995, some white residents of the street organized a citywide ballot proposition to reverse the change. Their efforts were defeated, and the street continues to be named after the famed Mexican American labor organizer. Intersection of César Chávez Street and Mission Street. 2008 photo by Freya Gefn. In addition to streets, the names of neighborhoods have also been the subject of proposed changes. In some cases, the proposals are perhaps only partly serious. JohnnyO, writer of the local blog Burrito Justice, has proposed the name La Lengua (Spanish for “the Tongue”) for a portion of the Mission District. In part, his writing about La Lengua helps to highlight the work of the San Francisco Association of Realtors to continually change neighborhood names in the hopes of increasing sales. Reverend Malcolm Byrd of the First A.M.E. Zion Church has addressed this issue in more earnest terms when he has decried realtors’ naming a portion of the Western Addition neighborhood “NOPA,” or “North of the Panhandle,” in an effort to erase the area’s African American history and population and make potential home sales more appealing to white buyers. The animal rights organization People for the Ethical Treatment of Animals (P.E.T.A.) also proposed a change of name of a San Francisco neighborhood when it lobbied Mayor Ed Lee in 2011 to change “The Tenderloin” to “The Tempeh District.” P.E.T.A. argued that the current name “echoes the violence and cruelty of the meat industry” and was inappropriate in a city with “some of the best vegan cuisine in the world.” The proposal met with some incredulity and was not pursued by either Mayor Lee or Supervisor Jane Kim, whose district includes the Tenderloin. As historian Peter Field notes on his walking tour, the name “Tenderloin” emerged in the nineteenth century out of the neighborhood’s role as a vice district. To change the name to “Tempeh” would risk losing a marker of that history. Whether proposed name changes have been intended as official city policy (such as the work of the 1909 commission), or conspicuously unofficial (such as Kenji Liu’s DART map), or somewhere in between (such as the work of the San Francisco Association of Realtors), each example highlights the ways in which place names can function to highlight or obscure the site-specific history of San Francisco.